Cellmax Allzymes is the newest enzyme formula in the market today. After years of research and testing we have come up with a strong concentrate Enzyme preparation with a concentration of 1:1000 1ml/L dosage. It’s very efficient and due to its concentration the enzyme formula contains more active elements. We have enriched this new formula of enzyme solution with extra phosphorus, potassium and vitamins to ensure healthy plant development. Application: Use this product at a rate of 1ml/L water from the 3rd week of plant growth until 2 weeks before harvest to achieve the maximum potency of this product. 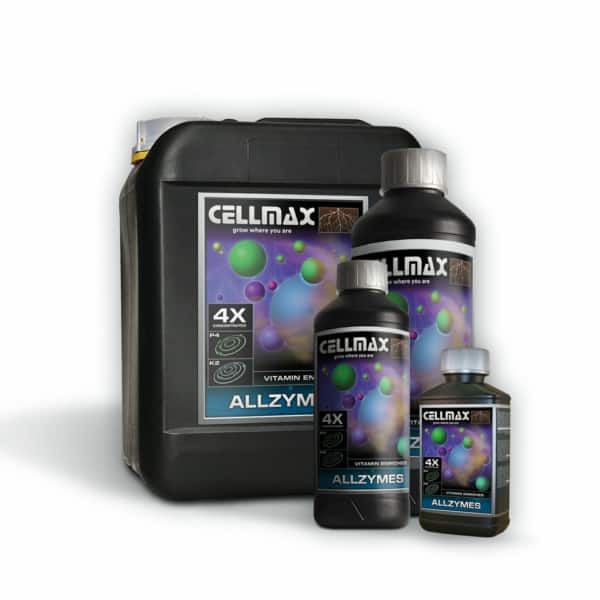 Cellmax Allzymes is the successor to the Cellmax Super Enzyme. This renewed product is a Highly concentrated enzyme preparation developped by Cellmax. This product has an increased shelf life due to its high concentration and gives the end user the guarantee of active elements. Allzymes contains: Active Cellulases and Pectinases Enzyme complexes.The active enzymes in this product will stimulate the micro life and regulates the degradation of dead organic material in the substrate. By breaking down the dead organic material, usefull sugars, nutrients and proteins are made available for the plant. Cellmax Allzymes is a unique blend enriched with vitamins, phosphorus, potassium and extracts from cactusus to activate the natural resistance of the plants. Directions for use: Dilution ratio (1:1000) 1ml to 1 liter of water. This product is suitable for any growing style and substrates. Guideline for growing: We recommend to add Allzyme continuously to you nutrient solution from the 4th week onwards. Guideline for rinsing substrate: When using older (untreated) substrates, double dosage. Usage: Shake well before use. Do not keep nutrient solution for longer than 2-4 days. Do not use this product with hydrogen peroxide. Note: This new formula contains a higher EC value than the previous recipe of Cellmax Super enzyme!